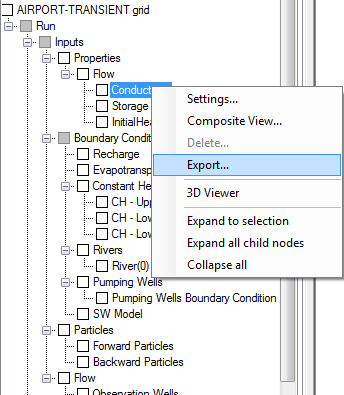 Visual MODFLOW Flex allows you to export some raw data and most of the numerical model inputs and outputs to shapefiles for external analysis. •From the Data Explorer, right-click on the desired data object, and select Export from the pop-up menu. •Specify a file Name and Folder location, and the File Type for the exported file, and then click the [Save] button. •Click the [OK] button from the Export dialog box. 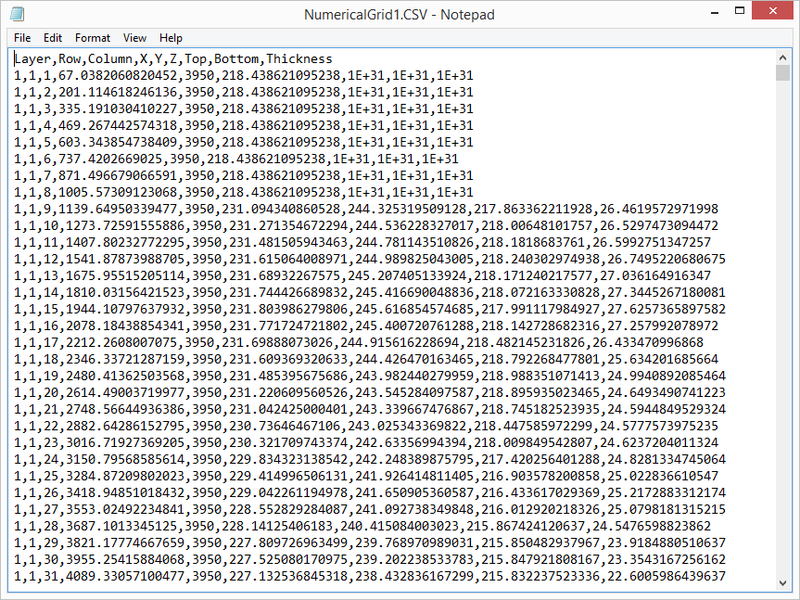 When exporting point shapefiles, one point will be exported for each applicable cell centroid. When exporting polygon shapefiles, one polygon will be exported for each applicable cell. 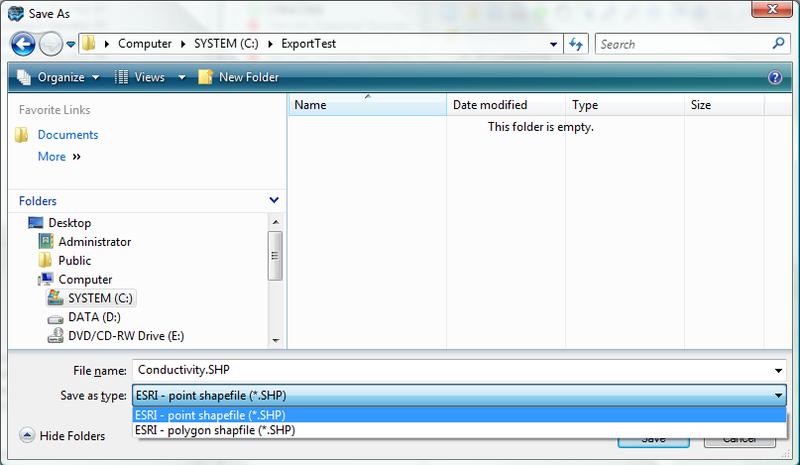 To export data on the model explorer, right-click on the desired item (eg. Conductivity), and select Export.... as shown below. 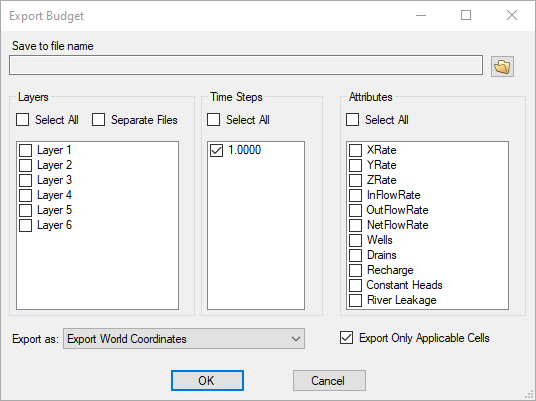 The following dialog will appear; note at the bottom you have the option to choose Points Shapefile or Polygon Shapefile depending on the type of data to be exported. Choose which attributes you want to be generated and what layers should be included. Click OK and the shapefile will be created. If your model has transient heads, you have an option to include Heads from multiple times as separate attributes in the shapefile .DBF file. Choose specific times or 'Select Heads at All Times' to include all heads. For transient heads, the attribute name notation is HT (head at time) followed by the time value - an underscore is used in place of a decimal, M is used in place of hyphen, and is used in place of plus. 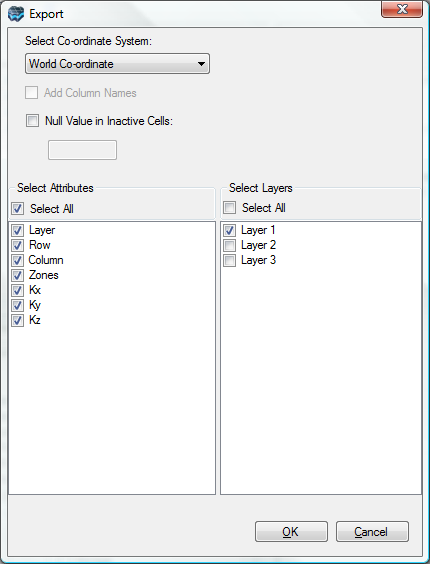 You are also able to export your flux data for Boundary Condition cell zones. After you have run your model you will find Fluxes in the Output of the model explorer - right click and select export and the Export fluxes dialog will appear. You must specify the location of the file. Then select which boundary condition group - and the specific boundary conditions. Output contour lines can be exported as polyline shapefiles for further analysis and mapping in external applications. To do this, enable the 3D subview to render the contours, then right-click on the contoured output (e.g. Heads, Drawdown, Concentrations) and select "Export contours...". A polyline shapefile will be created for the contours as specified in the relevant object settings. You can adjust the contour lines, including adding custom lines, using the ThreeSlices>ContourLine settings in the 3D subview or the ContourLine settings in a 2D subview. Pathline and time markers can be exported to shapefiles for further analysis; right-click on the Forward or Backward Pathlines on the model explorer, and choose Export. A points shapefile will be created for the time markers, and a polyline shapefile will be created for the pathlines. The exported files will utilize the pathline options you have currently defined in the view for the tracking time and time marker frequency. See the section on visualizing particle track results for more information. Then you can provide the location and select if you want .CSV or .TXT. Once you select Save you will be notified that the layers have been exported and given the option to open the exported file. The resulting file will contain Layer, Row, Column, X, Y, Z, Top, Bottom, and Thickness information. Boundary conditions can be exported using the same steps described for exporting Model Layers above. 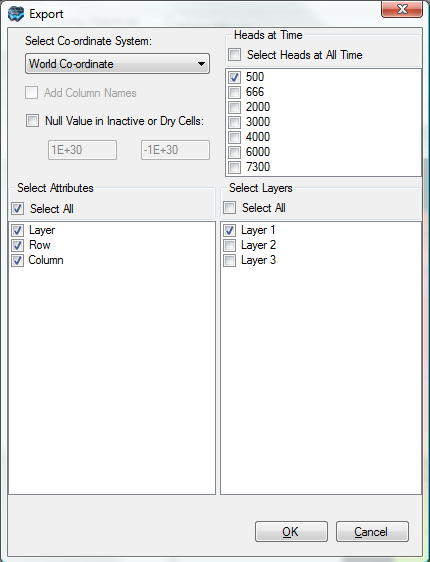 Boundary condition data fields will be exported along with the Layer, Row, and Column data fields. Data fields for stress period start and end times will be added if the boundary condition is transient.